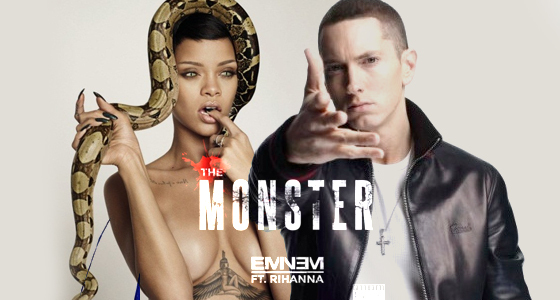 Once again Marshall Mathers teams up with Miss Fenty Riri to throw down another “Monster” masterpiece. I vowed to not write another video news release because music channels out there have fallow video hosts who like to use my words on air. Main example is a little news piece back in the day on “Love The Way You Lie“, thanks to my loyal friend who informed me of this faux pas. If you’re going to plagiarize someones work at least change up the words, laughs! This is not a news release more like a song and video review…Did not go into too much detail regarding this track in the review of “MMLP2” for good reason! I had this up my sleeve for a minute now, today it can be published because the video has been released. The song itself is in reference to Eminem’s multiple personalities and how he is still actively feeding the monster under his bed and vice versa. In the video directed by Rich Lee, Mathers plays a patient and Rihanna is the doctor. As Rihanna sings “I’m friends with the monster that’s under my bed / Get along with the voices inside of my head / You’re trying to save me, stop holdin’ your breath / And you think I’m crazy, yeah, you think I’m crazy.” Mather’s reflects on his past accomplishments and demons using flash backs of The Monster’s reign. It was clever to redo and incorporate those specific videos to tell the story of the song, which goes fittingly with the lyrics. People fail to convey the message in video form these days. “Cause I need an interventionist to intervene between me and this monster / And save me from myself and all this conflict”. One of the video clips embedded within was when Eminem had his moment with Elton John, my guess is to reiterate he is not a homophobe. “I’m just relaying what the voice in my head is saying / Don’t shoot the messenger, I’m just friends with the…” People need to remember he is just utilizing his freedom of speech, does not mean he actually believes some of the things he says, it’s just art.